Francesco Antinucci is Research Associate at the Institute of Cognitive Science and Technology of the National Research Council (CNR) of Italy, where he was formerly Director of Research. His research interests have been centered on cognitive processes – such as perception, reasoning, learning -, their development in infancy and their evolution in phylogeny. In recent years his research efforts have been concentrated on the interaction between cognitive processes and the new interactive technologies of multimedia, digital networking, virtual reality. His special field of interest has been the communication of cultural heritage in museums and archaeological sites through digital technologies. In this area he has designed and implemented several multimedia and virtual reality systems for temporary exhibitions and museums, as well as virtual museums on the web. He has directed the communicative restructuring of a number of museums. He has been affiliated to the Palo Alto Research Center (PARC) of Xerox Corporation and to the School of Information of the University of California, Berkeley. 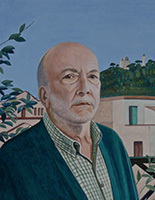 He has taught at the University of Rome and Milan Polytechnic The followings are his most recent books: Musei virtuali (Laterza, 2007), L’Algoritmo al potere (Laterza, 20112), Parola e immagine. Storia di due tecnologie (Laterza, 2011), Comunicare nel museo (Laterza, 2014).